Round three continues as the Beekeepers and Cosmopolitans fight it out for a place in the quarter-finals. 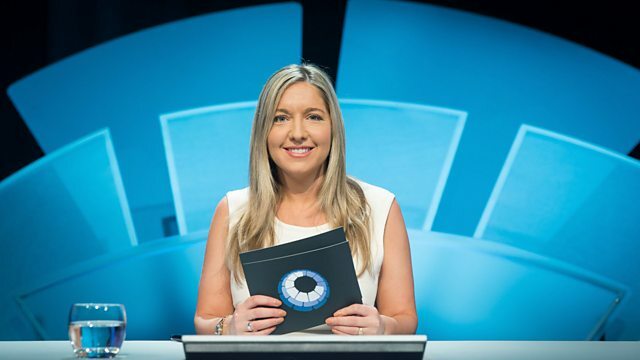 Victoria Coren Mitchell hosts. Browse content similar to Beekeepers v Cosmopolitans. Check below for episodes and series from the same categories and more! because I've got a bit of a headache. Last night someone plied me with triple vodka after triple vodka. but I think it was me. So turn the volume up because voices are going to be hushed. for a portrait while sitting down for a rest at a villa in Greece. who recently holidayed in a minefield in Nagorno-Karabakh. and then you beat the Policy Wonks. That's how you came to the third round. You confident of another win tonight? but all I'm saying is we're fans of lobster thermidor. Let's see what you mean by meeting this evening's opponents on my left. a medical journal editor who has bathed atop a Turkish mountain. successfully delivered a mobile dentist to the Channel Islands. Now, on your journey here you beat the Taverners and then the Tubas. What do you think of tonight's opposition? A lot of confidence talk from both sides. Animal lovers will be writing in in their droves. to Round Four and who has to play another match to get there. Nobody goes home at this stage. but you decided to put your opponent in first. So, Cosmopolitans, please choose a hieroglyph. and it is the music question. This is Shirley Bassey, isn't it? -So that was Nightingale Sang In Berkeley Square. This is Diamonds Are A Girl's Best Friend or something. for a possible bonus point. -Diamonds Are A Girl's Best Friend. Lovely. And the last one? Well done for a bonus point. And you may choose your own question. May we please have the Twisted Flax? What is the connection between these clues? All right. Go for it? followed by the new capital. even to the first clue. chance for a possible bonus point. These are the biggest cities. and they are larger than the capitals. either, which you hadn't seen. cities by area and population. And now your turn to choose a question. -Oh, well, in that case, shall we go for it? Things that happen on Sunday. for coming in after two clues. Things that happen on a Sunday. it moved to Sundays in 1999. Do you stay up for those? Stay up and watch the Oscars? Oh, I love the Oscars. "just a lot of new faces." but it was Sundays until July, 2015. Well done. Back to you, Beekeepers, for a choice. I need to hear something else. They are all Thomas Hardys. this into a two-clue game. Talk me through what we're looking at. Obviously they are all Thomas Hardys. cap right I'd be drummed out. OK! That's right. "Kiss me, Hardy." Tom Hardy, Bane from, um, Batman. in The Dark Knight Rises. Tom Hardy, the actor, he's known as. real name is Edward. Do you know...? in the Guy Ritchie film RocknRolla? There's additional points on this. One of my favourite of his roles. My goodness. We'll be finishing the show early. We can all go for a drink. You'd like that, Cosmopolitans, I think. -I meant at the bar later. LAUGHTER But I suppose we'd better do this first. Two Reeds? OK. These are going to be picture clues. Something connects them, what is it? -What on earth is that? Things that you need to make a Victoria sponge cake. The ingredients for a Victoria sponge? Would be one acceptable answer. what do you think will be in it? I'd never heard of this. formation for a very big team. -it was a Victoria sponge. the cake recipe as well. And how are your cakes? It's always a Victoria sponge. Very good point. Well spotted. Beekeepers, the last question of the round. Eye of Horus. That will be yours. Particular...? Shall we have another? of South American capital cities. What are the cities in Spanish? La Paz and Buenos Aires. On to Round Two, the sequences round. so please choose a hieroglyph. -Things that happened on particular dates? um, yeah, I think 9/11 is the answer. Um, the attack on the Twin Towers. It's poignantly jolly, isn't it? final the Williams sisters played. to go a bit horrible. the World Trade Centre. Well done. Beekeepers, what would you like? Ooh, it's the music sequence. So you'll be hearing the clues. I still want to know what comes fourth. # Where are those happy days? a go for a bonus point? But we don't know which one the next one is. Right. I certainly can't take that. Now, why do you say ABC? For exactly the same reason! but we couldn't quite spot the sequence. something that is five letters. Katy Perry featuring Kanye West. SOS, ABBA, YMCA, The Village People. of five letters, for example? That's the one we all know. -You all know that one? remind them with a rousing blast. people they never shout "desirable"? Although I'm afraid I can't give any points. Cosmopolitans, please choose another question. OK. What would come fourth in this sequence? No idea. And they're colours, as well. -OK, so it's a green L.
It is a green lower case L.
by order of when they appear? When the first one appears? Of when the first colour appears. the first one at the beginning of it, and they're blue. the last colour to appear, is green. OK. I want to know what will come fourth in this sequence. They're not, erm, not, erm, election where the...? -Shall we go for another? Um, so it could be... West Virginia? Why do you say Louisiana? Right. No, that's not the sequence. What were you thinking over there? That it was a state. No, I'll tell you what it is. "Which one is the most racist?" Do you know what happened there? First state to secede from the Union, South Carolina. but Cosmopolitans, you may choose a question. These are going to be picture clues. What would you expect to see in the fourth picture? Oh, it's the ghosts, isn't it? So Christmas yet to come. but I will accept 2027. -They're the ghosts in A Christmas Carol. represented here by the singer, Bob Marley. And Christmas past, why 1843? Maybe that's when it was written? in which the ghosts appear. Water. What will come fourth in this sequence? Shall we do...? One more? Restores you to your normal size. I'm afraid that is not the answer. when she consumes them, in order. explain why in a minute. Makes your neck very long. Cos there is a "drink me" that makes you small, isn't there? exactly what you mean. It's in The Pool Of Tears, chapter two. She has the "eat me" cake. -And it does make her very tall. is the bottle of drink. It's a whole different thing. -Yes. But that's absolutely it. "largest telescope there ever was." of it but it doesn't quite work. Cosmopolitans have a rather amazing 16. Time now for the Connecting Wall. It'll be the Beekeepers to go first this time. You chose to go second initially, so you're in first now. Would you like Lion or Water? Two and a half minutes to solve the Lion wall, starting now. OK. So Pippin and Merry are both, erm, they're hobbits. Show of force, show of strength. Gaffer tape and cassette tape. OK, we'll leave this one. OK, so he's going there. Is he? Yeah. What else have we got? Healing hands? -OK, so we've got healing hands, show of hands. HE LAUGHS Three strikes and you're out now. So Gaffer, Ticker, Duct, Cassette. We've tried that. Which other one of those might be a tape? -twill tape, merry tape, pippin tape, Sam tape. Pippin, Merry, Sam and Gaffer. Very impressive. So that's four point immediately for the groups. Let's have a look at the connections. Do you know that as a beekeeper? No, I know it as an apple enthusiast. Were you familiar with the Jonathan apple? -What does it taste like? -It's not one of my favourites. It's a bit lightweight, a bit fruity, bit of white flesh. Is apples not a thing to grow in the garden to attract bees? and something to show at the end of it. to stop the wasps getting, cos the wasps will attack the bees. I feel a spin-off show coming on. In my experience, Jonathans never taste as good. Let's move on to the next group. Healing, Join, Greg, Show of. These are all followed by the word "hands". MP for Chelsea and Fulham. And show of hands. And what about this next pink or purple group? They are, like so many of our visitors here, significant hobbits. That's right. Pippin, not an apple, that was a red herring. And the last group. Twill, Duct, Ticker, Cassette. -They're all types of tape. of two. That is a maximum of ten points. Very well done. glass of water. It's not that healthy. You have two and a half minutes to solve it. -So the Picasso Museum, the Louvre, the art museum. -So there must be something where it's a word. Window, rose window, bay window. It's got to be museums, hasn't it? So, Sleep, Power, Street, Hill. -Can you take any other words out? Are we sure we've got the museums, though? That's the question. Well, we don't know but it's so likely, isn't it? But if we try it and it's right, we're resolved. We've got a little while. Yeah, but these are all, I think, French, aren't they? Picasso museum is not in Paris. It's in Barcelona. I think we should just go for it. That's it, you solved the wall. Well done. And what about the connections? Tell me about the first blue group, starting J. They have surnames that are just letters. That is absolutely right. That is the American rapper Jay Z, Malcom X.
Jessie J and Agnes B. They all have initials as surnames. And what about the green group, starting Bay? -Bay window, rose window shop window, louvre window. The next group, starting Picasso. They are museums in Paris. Absolutely right. And the last turquoise group, Power, Hill, Sleep, Street. Power walking, hill walking, sleepwalking, street walking. -It was the street that threw us off. and three for the connections, it's a total of seven. Let's have a look at the scores. The Beekeepers have 14 points, the Cosmopolitans have 23. So it's on to Round Four - the missing vowels round. out of well-known names, phrases and sayings. what the disguised clues are. So fingers on buzzers, teams. The first group are all road signs. Too used to ignoring this one. Please drive carefully through our village. I'm afraid that is not a road sign. Cosmopolitans, do you know? -A few cards short of a deck. -Clowns short of a circus. No, too long, I'm afraid. Beekeepers, do you know? -Bricks short of a load. Sandwiches short of a picnic. You've got the hang of it. But it's a new category. the end of the quiz. clue but that's what it was. Beekeepers, you're not going home, you will get to play again. You've got another attempt to make it through to the quarterfinals. We'll be seeing you later in the series. Round three continues as the Beekeepers and Cosmopolitans fight it out for a place in the quarter-finals. They compete to draw together the connections between things which, at first glance, seem utterly random. Join Victoria Coren Mitchell if you want to know what connects... Saint James, Assumption, The Peace, Good Winds.